Existing power management ICs (PMICs) require many different components with many different technologies that cannot be integrated. Many of the passive components can reduce in size if the switching frequency is increased – but there is a practical limit. PMICs utilize traditional buck converters that are hard-switched, causing both significant noise (EMI) and switching losses which increase dramatically with increased switching frequency. As a result, the world of PMICs has been relatively stagnant with switching frequencies in the range of 500kHz to 4MHz, maintaining a large footprint and very low bandwidth regulation (slow speed). As SoC’s have utilized smaller deep-submicron geometries to pack in more functionality at higher switching frequencies, on-chip fast current transients have increased dramatically. Due to the significant distance between the SoC’s power source (PMIC) and its core, the power delivery network (PDN) exhibits very high impedance along the current path, leading to tremendous voltage excursions at the core of the SoC. SoC designers have dealt with this by increasing the PMIC set-point voltage by 10% or more to compensate for the on-chip voltage transient dips. This voltage design margin (a.k.a., guardband) produces wasted energy at a rate of the voltage increase squared (i.e., for a 10% guardband, the energy wasted is 1.12– 1 = 21%). The ultimate solution to this worsening problem is to bypass the PDN impedance by fully integrating the voltage regulator into the SoC silicon. The challenge is how to accomplish this at high enough frequency for full component integration without adding switching noise/EMI and while maintaining high efficiency. 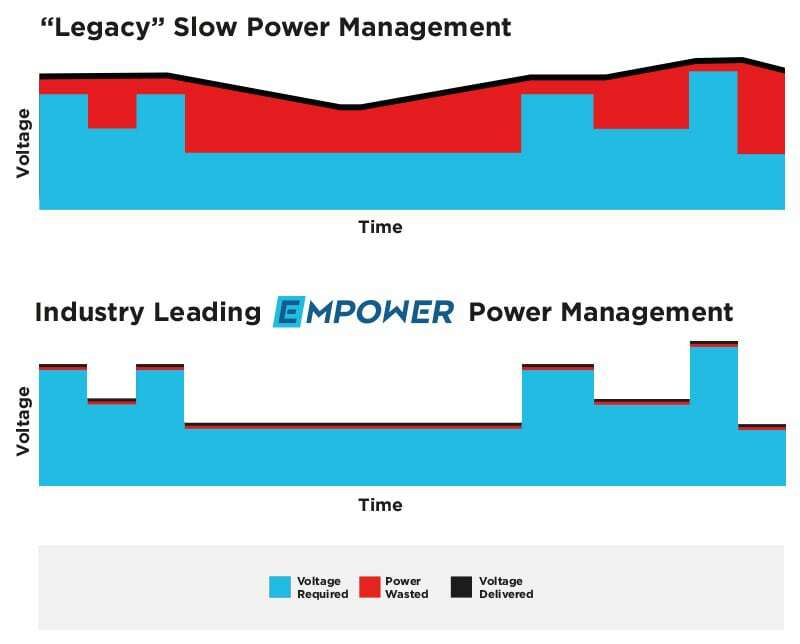 Empower has invented an all new way to design power management ICs using a novel Resonant Intergrated Voltage Regulator (RIVR™) architecture which fundamentally minimizes switching losses and EMI, enabling a dramatic increase in switching frequencies and commensurate size and cost reduction of the passive components in the power system. In addition, new power structures have been invented which can be designed in standard CMOS allowing, for the first time, all power management components (including inductors and capacitors) to be integrated into one CMOS IC without the need for elaborate high frequency magnetic materials. 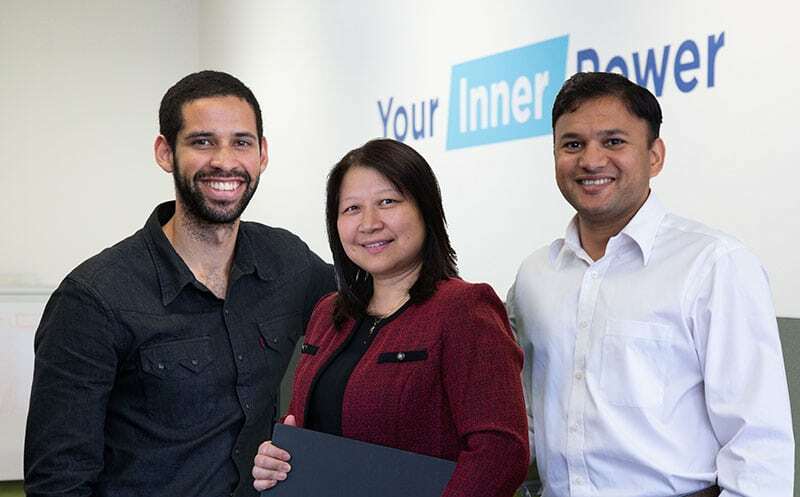 Once integrated into a CMOS SoC, the real benefits of your inner power come to life. Not only is the board footprint external to the SOC reduced in size and complexity by 80% or more, the cost of those components disappears as they are integrated into the SoC for a fraction of today’s cost. But the real power of your newly integrated power is in the performance that is enabled. Based on the speed of this proprietary resonant convertor and the eliminated PDN impedance between the SoC and the external PMICs, the Empower Resonant IVR™ can now deliver voltage accuracies that are up to 5x improved, reducing excess voltage design margin, translating into over 20% energy savings. Furthermore, voltages can be dynamically scaled up or down (DVS) up to 1,000x faster than existing PMICs, enabling SoCs to optimize power/performance tradeoffs like never before, enabling additional energy savings of 30%+.